Governments are engaged in a race to the bottom on corporate taxation. Tax rates are falling and tax incentives are multiplying. This is bad news when it comes to financing development. Citizens must demand transparency and accountability regarding tax incentives, and regional and global cooperation to set a floor under corporate tax rates. The Sustainable Development Goals call for trillions of dollars of new investments in health care, education, agriculture, climate change adaptation, and more. Most of that funding is supposed to come from domestic resources. 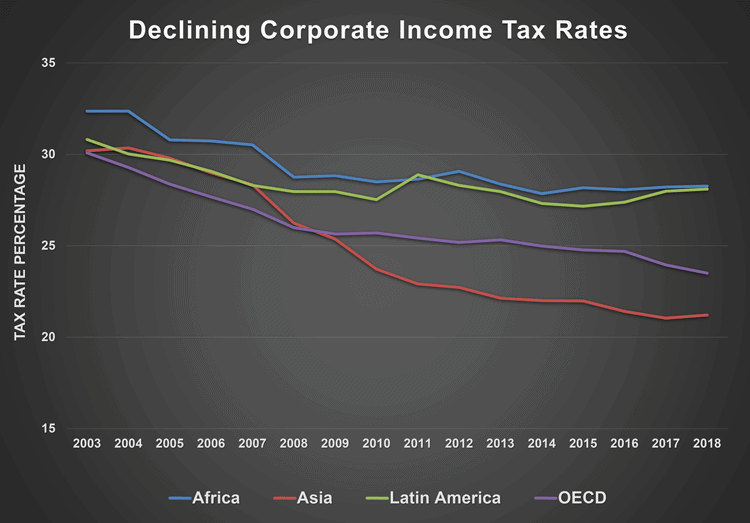 The corporate income tax represents a major source of domestic revenue for low-income countries – around 20% of their total government revenue. Yet corporate tax rates are trending downwards. Last year the world’s largest economy, the United States, dramatically cut its rate from one of the highest (35%) to just below the average of rich countries (21%). The IMF estimates that U.S. tax reform will spill over onto other countries, cutting their revenue from multinational companies by up to 5% if they maintain their current policies, or by as much as 13% if they respond by decreasing their own tax rates in line with current trends. In addition to lowering the rate for all companies, many countries shoot themselves in the foot by granting tax incentives to specific industries or individual companies. Incentives include tax holidays (i.e., temporary tax exemptions), special economic zones (i.e., tax-free geographic areas), or reduced tax rates. Governments are desperate for foreign investment and use such incentives to lure multinational companies into investing in their country instead of their neighbors. Foreign investment is important. But study after study shows that tax incentives are not very effective at attracting it. This is particularly true for extractive industries, where investments are tied to the location of resources, as well as for services like telecoms or tourism, where investments are tied to where customers are. These sectors account for the lion’s share of foreign investment in low-income countries. Business surveys confirm that taxes are low on companies’ criteria to choose investment locations. The vast majority – 93% in four low-income African countries – of investments that benefited from tax incentives would have been made without them anyway. Developing countries’ governments forego billions of dollars to tax incentives, often several percentage points of their GDP. That means funding for poverty alleviation programs is cut. It also shifts the tax effort onto workers and consumers. Poor people are hit by a triple whammy. Why on earth do governments continue to waste money on such corporate giveaways? Governments uniformly proclaim that they have no choice but to grant corporate tax incentives and reduce rates because their neighbors have done it. That is not good enough. Perhaps it is just a matter of time and education for the evidence to sink in? After all, the neoliberal ideology has prevailed for years and continues to be hammered in through competitiveness indices like the World Bank’s Doing Business Index or the Tax Foundation’s International Tax Competitiveness Index. Still, mainstream opinion has started shifting. Or else we are left with considering the worst hypothesis: government officials like tax incentives because they create opportunities for corruption. Oxfam has produced a number of case studies illustrating how private interests manage to shape fiscal policy in Latin America. The International Budget Partnership documents the opacity of decision-making processes for tax incentives in the same region. National tax justice alliances have emerged to campaign on this agenda in many countries from Uganda to Pakistan. They need help. Any civil society organization that demands government spend more money on anything – from health care to agriculture – should join them, because there is not going to be more government spending without more government revenue. Tax justice alliances should work more closely with NGOs of different sectors to show the human cost of tax incentives and low corporate tax rates. Tax competition is a unifying theme that civil society could push during electoral campaigns. The global Fight Inequality Alliance has been successful at weaving links among groups, telling stories, and mobilizing the public on issues like taxation. The debt crises that are looming over several countries offer another opportunity for change. Governments typically restore fiscal balance with “turn-key” reforms, like increasing the VAT rate or freezing civil servants’ salaries. Such measures hurt the poor and sometimes trigger large-scale protests. Tax justice alliances should be ready to seize such moments to demand the elimination or reduction of tax incentives for multinational corporations, which can in some cases be implemented quickly. Emulating ICIJ’s work on tax avoidance, investigative research on emblematic cases of wasteful tax incentives would be helpful generate media attention. Regional scorecards ranking governments in terms of the transparency, governance, and design of their tax incentives could inform the debate as well. Tax justice alliances could also create forums for dialogue with government officials and business leaders who accept they have a social responsibility regarding taxation. Such dialogue could help share knowledge and build consensus over the right approach to tax incentives. Such forums should best be held at the regional level, where most tax competition takes place. Although tax is not near the top consideration to locate foreign investment, it is not completely irrelevant. That is especially true in manufacturing, which might explain why corporate tax rates have been falling faster in Asia than in other regions. National tax justice coalitions should join forces to put tax competition on the agenda of regional institutions. Ultimately governments should gang up and set a floor under corporate tax rates and adopt a joint mechanism to monitor tax incentives.